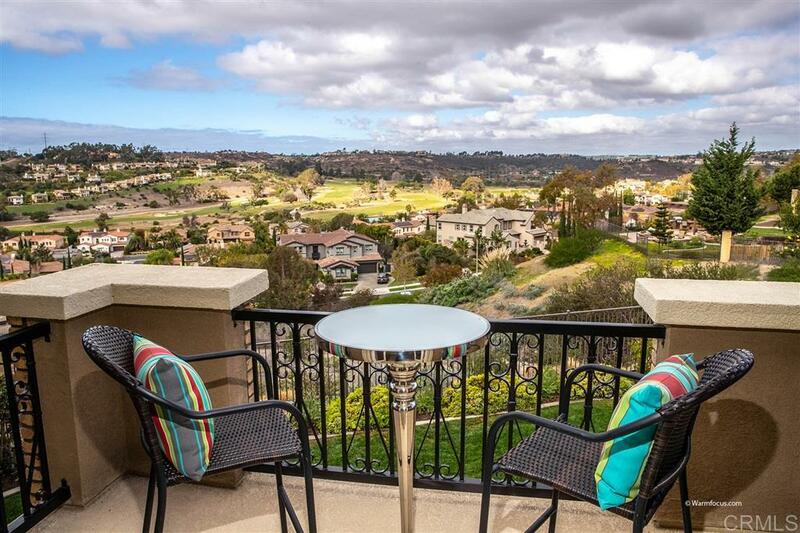 Drop dead gorgeous GOLF COURSE VIEW home in uber popular La Costa Greens. Private cul de sac & no neighbors behind. Nearly $300K in high end upgrades inside/out incl. custom paint, crown molding. 4BR floorplan+loft & custom office. Chef's kitchen w/Thermador pro series appls. Master suite w/view balcony & spa-inspired bath+custom closet. Private yard w/built-in BBQ island/bar, fire pit & spa. Garage w/epoxy floors+extra storage. Plenty of room for pool but incl. access to all HOA amenities. See supp., Immaculate and drop dead gorgeous GOLF COURSE VIEW home in uber popular La Costa Greens at the end of a cul de sac with no one behind you. Fabulous floorplan including 4 bedrooms plus loft plus office with custom built-in desk and bookcases. The parlor is like a formal living room. The den/office has a built-in two-sided desk in it and a built-in media center/book shelf, and is rough plumbed to add a bathroom if you ever wanted to add a bedroom and bath downstairs. Almost $300,000 in high-end upgrades inside and out, meticulously selected and cared for by the original owners. Gourmet kitchen includes Thermador Pro stainless steel appliances, prep island and custom cabinets. Master Suite with private view balcony and spa-inspired bath plus custom closet. Every single bathroom has been beautifully upgraded with custom countertops, backsplashes, tub and shower tile. Gorgeous built-ins both upstairs and downstairs. 3 car garage with epoxy floor and built-in storage cabinets. Yard has a built in BBQ island/bar, a fire pit and spa. Plenty of room if you ever wanted to add a pool but in La Costa Greens, you have all the access to HOA amenities - âThe Presidioâ which includes an expansive clubhouse, fully equipped fitness facility, gorgeous swimming pool with private cabanas, resident only access to sparkling pond with waterfall, private tennis courts & community parks.